The fencing team opened its season with a bang Saturday afternoon at McGonigle Hall for the 31st annual Temple Open. Led by senior captain Audrey Barroso, the team nearly swept the winner’s stands, finishing first in two of the three events, while taking second place in the third. “We were very pleased,” coach Nikki Franke said. Senior captain Audrey Barroso won the sabre event, freshman Epiphany Georges won the foil event, and freshman Chantel Montrose took second in the epee event. Not only did Franke guide her team to an impressive showing with seven total finalists, but she also organized the entire event herself. While the success of the tournament was satisfying for Franke, so was the performance of her freshmen. “It’s very nice since it was their first collegiate tournament so that’s a good memory for them to have,” Franke said. 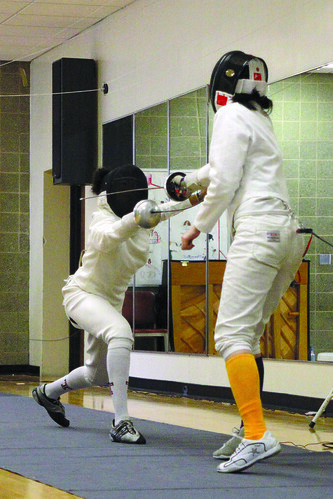 Tasia Ford, another Temple freshman, took sixth place in the sabre, while junior Alyssa Lomuscio and sophomore Mikayla Varadi placed fifth and seventh, respectively, in the foil. Junior Jill Bratton tied for third behind Montrose in the epee event. Although Franke has built one of the top fencing programs in the nation with 600 career wins, she said winning at home is always a treat for the team. The team will continue to enjoy this success at home before preparing to hit the road next week for the first time this season. Jeffrey Janiczek can be reached at jeffj@temple.edu.